One complicated thing on that list today was creating a menu. I never made it to the store over the weekend, so at first, after organizing the fridge (and throwing away a nasty orange that I forgot to take a picture of but that's the only food waste I had last week), I scratched my head wondering what in the world am I going to feed my family. But then I decided to challenge myself and create a menu from what I have on hand to last me until next Saturday. 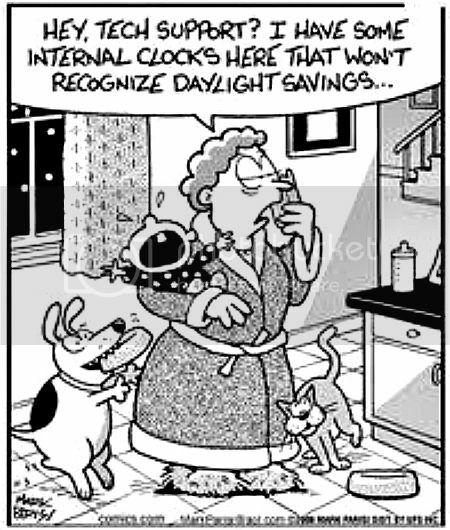 Our clocks go forward on the 30 March this year and I don't like the spring one either. Loosing 1 hours sleep is no fun. Your menu plan has given me a great idea for our tea tonight. I have left over sausages and home made pasta sauce. Thanks for the idea, Lena. Ha ! love the clipart. Indeed, I find I have a lot more food than initially thought when talking myself out of grocery shopping. All I have in the fridge today is 1/4 block of cheese, condiments and sliced ham (not even sure that's still good). So I had canned soup, ha. But yeah, I will go grocery shopping today on my lunch break and get some real foods. I'm going to restart my low-carb diets, so I'll be buying mostly fresh and frozen veggies. Still haven't decided what I want to eat for this week. Your plov (went to check the recipe) looks like what we call locrio back at home, though it's mostly done with chicken (whole pieces or cubed chix breast) or salami. Your menu sounds delicious! I checked out your recipe for plov and I think I am going to try that out sometime soon- it looks and sounds great! The crepes sound good too- do you have a certain recipe you use to make them? It is often true that we have more in our fridge and pantry than we think. Sometimes, when I think we are running low on things, it really means that we are running low on what's easy. That's how it is for me anyway. That's really good for not having food in the house! :)! I like doing that every once in a while to clean out. Your menu sounds delicious! I am still trying to make the hour up. We are eating from the freezer and pantry for March and April and maybe a little of May before another great stock up. I am making sure nothing gets wasted and thrown or thrown out and we should make it OK. We need to have a recipe day where every blogger posts a few recipes! We are due to lose the hour shortly. I really hate it!